With spring approaching, it's time to stop hibernating and hiding from the fact that you didn't get around to those New Year's resolutions. Press pause on whatever show you've been binge-watching, put on some big-girl (or boy) shorts, and head outdoors -- there's plenty to do in Oahu this season. From cultural celebrations and concerts to whiskey and chocolate tastings, here's our calendar for all the great events to check out this spring. Now in its 15th year, this film festival presents 10 movies and documentaries highlighting the Jewish community. Each month, Ward Village presents a movie curated by the Hawaii International Film Festival, and this month, its selection is Winter at Westbeth, a documentary about a year in New York City's Westbeth Artists Housing. Admission is free but seating is limited, so get your tickets here. This three-day event features dance performances, educational tours, craft fairs, movies, and more by artists from Japan, Australia, Tahiti, the Philippines, Taiwan, Korea, Hawaii, and the mainland, promoting cultural peace and harmony. The festival holds events at various locations throughout Honolulu, culminating in a parade down Kalakaua Ave on Sunday. Put a squad together and compete for dancing glory, in basically any style except cheerleading and gymnastics -- winners get a chance to perform at the Honolulu Festival Grand Parade. For those looking to brush up on their moves, a free dance workshop features choreographers from Hawaii and Japan. Gather your fastest pals and run a hilly 5K route from Kapiolani Park to Diamond Head and back. Even if you're not intending to break any records, the runner's high and ocean view are worth the early morning sweat. The event is held at Kapiolani Park during the Honolulu Rainbow Ekiden, so runners, supporters, and eaters alike can fuel up or celebrate with bite-sized snacks, cold desserts, and full-plate lunches from a variety of food trucks. This new contemporary visual arts festival is titled Middle of Now | Here and showcases pieces from the Pacific, Asia, the Americas, and Hawaii's diverse culture. Join docent-led tours, workshops, artists talks, roundtable discussions, performances, and parties. Check the continually updated calendar of events for more details. Held every third Friday, this monthly marketplace showcases local artists, crafters, and performers at this family- and pet-friendly event, held in collaboration with the PA'I Foundation to promote Hawaiian arts and culture. With nearly 100 vendors to peruse, antique and vintage collectors will have much to uncover with booths selling everything from estate jewelry and mid-century décor to aloha shirts and Hawaiiana. Let comics tickle your funny bone at Sandy Wexler's "Here Comes the Funny Tour"
We'll just leave this here: Adam Sandler, David Spade, and Rob Schneider -- all under the same roof. With over 130 craft beer options from over 65 American breweries, you'll need a game plan to narrow down your choices. General admission gives you three hours to fill your souvenir sampling glass, while VIP access gives you 90 extra, much-needed minutes (and food vouchers and a commemorative hat). Treat your eyes and ears to music and hula events at hotels, beaches, and various venues across the islands, where you'll find everything from ukulele, traditional Hawaiian music, reggae, and rock. The local ukulele virtuoso stops in Oahu for six performances on his international tour of his new album, Nashville Sessions, an album he wrote and recorded live in the studio, blending rock, jazz, and classical music. This annual three-day convention features all things Japanese anime and manga, from video games and costume contests to an artists alley, dealer's room, and formal ball. It's pure nonstop entertainment for anime lovers. Take your date night to sweet levels at this local chocolate factory class, where you'll make love connections with some of the world's best Scotches, bourbons, and whiskeys with robust and rich locally made sweets. Kalakaua Ave shuts down for six hours of food, rides, shopping, and games. Admission is free and open to the public. If running through lush jungles and sandy beaches sounds right up your alley, form a team of eight members (or a four-member superteam) and spend the weekend clocking miles on this ultra-long-distance relay race. While you're not running spend time camping out and eating s'mores in Ragnar Village. The beloved canned-meat festival celebrates all things SPAM with an annual block party on Kalakaua Ave. Listen to live music on two stages while indulging in the popular island treat, served in its traditional musubi form and various creative iterations. May 1 is Lei Day in Hawaii, celebrating the welcoming custom of giving and receiving lei. Celebrate with live music, lei exhibits, and demonstrations for a beautiful and fragrant experience. It doesn't matter if you prefer ebooks or those old-fashioned paper ones -- it's always great to promote literature. Listen to live bands, authors reading their works, or shop for a new addition for your personal library. Complete a 1,500-meter swim, 25-mile bike ride, and 6.2-mile run and forever earn triathlete bragging rights. Watch Elvis be brought back to life in "All Shook Up"
This musical comedy features the King’s classic hits in a fictional tale of mistaken identity and romance. Local farmers who promote healthy eating unite at this yearly community event. Shop crafts from artists, join in educational workshops, listen to live music, and shop plant sales while supporting local agriculture. 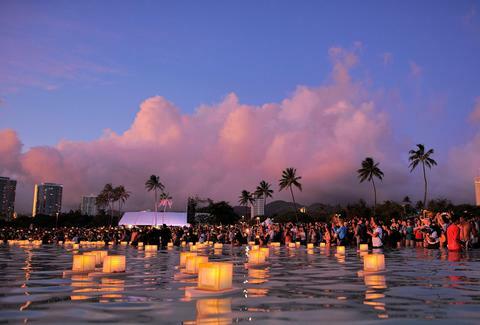 Every Memorial Day, thousands flock to the beach to honor those who have gone before us, placing floating lanterns with wishes of peace and happiness into the ocean as the sun sets into the Pacific. It's a beautiful way to herald in the next season. Summer Nakaishi is a freelance writer for Thrillist whose third-favorite season is spring.